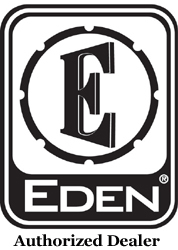 Eden is an American company that began in 1976. The company takes its name from Eden Prairie the location where the idea for the company was conceived. Specializing in the requirements of the bass musician, Eden designs and manufactures high-end bass amplification systems. This includes bass amplifiers, pre-amplifiers, power amps, bass pedals, and bass cabinets. Edens amplifiers span a variety of applications but its most famous series of products includes the World Tour Amplifier and D-series Cabinets. Eden's reputation was founded on the fact that everything was designed and built "in-house", including the speakers (a very rare feat by any manufacturer). The cabinets are still made in the USA, as are the speakers used in the cabinets. These use the same original design and engineering principles but are now produced exclusively for Eden by Eminence. Eden also sells a range of other products, such as WTX amplifiers. These use a switching power stage. E-series amplifiers and cabinet and Combos provide easy-to-use Eden tone for less experienced players.